Once upon a time*, I purchased a mini-charm pack filled with every gorgeous color from Paintbrush Studios solids. 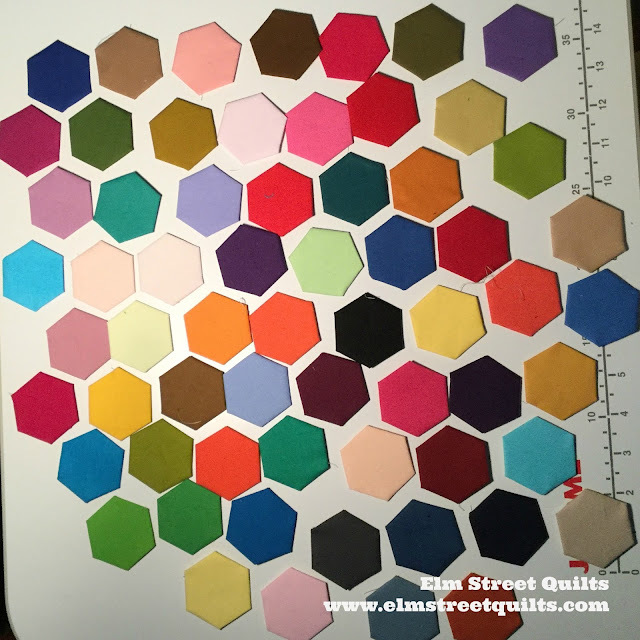 With no specific project in mind, I turned them into about 100 hexies. And then I started to assemble them - randomly. 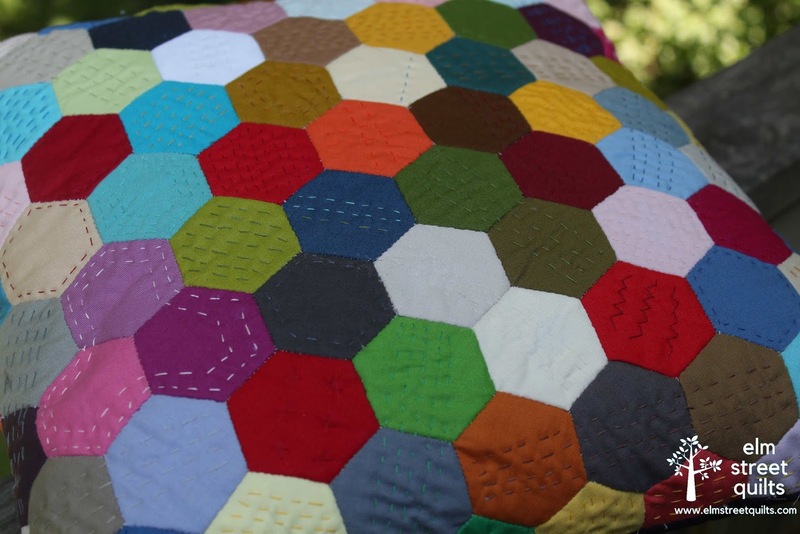 I disciplined myself to blindly pick a hexie and attach it irredgardless of the color of the neighboring hexie. I continued in a clockwise direction until essentially it was time to square off the project. Placement was still random though. All complete, I adhered my project to fusible fleece** and then sewed a basting line all around the edge. Then, more random fun. I gathered all my thread - a mix of Aurifil & Superior So Fine - into a basket and proceeded to hand quilt. Patterns we again randomly done. Most of the time these were running stitches but a few times I got a bit 'fancy'. Thread was either coordinating color or it not - everything was fair game. 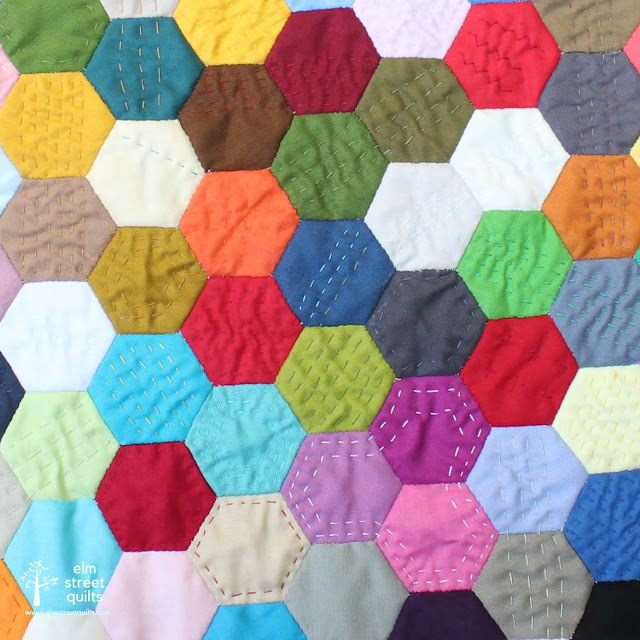 One every hexie had at least a line of hand-quilting. I squared the project up to 15'', redoing the basting stitch along the edge where needed. Love the way the back looks! For the back, I followed my own tutorial to add a zipper and used a navy blue with a accent of some Sweetwater text fabric. And now I have a beautiful pillow. Pictured above on my couch, the pillow actually now sits on my comfy gilder rocker (left over from when my kids were babies) where I like to sit and read or stitch at the end of the day. What a fun finish and I really love that you sit with it at the end of the day. 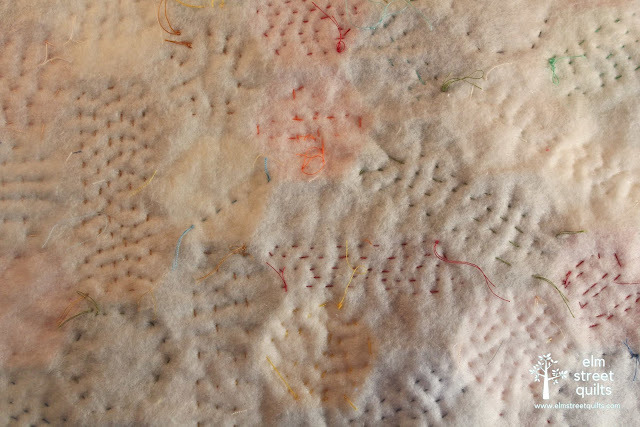 Thanks for sharing how it was to hand quilt with the fusible fleece, I'll definitely try to file that away to keep in mind in the future. Hey this is a beautiful pillow! Very pretty and your hand quilting makes it even prettier. It's amazing. I like the different quilting throughout. Well done! Beautiful finish. So colourful and bright. Great job and a great finish. 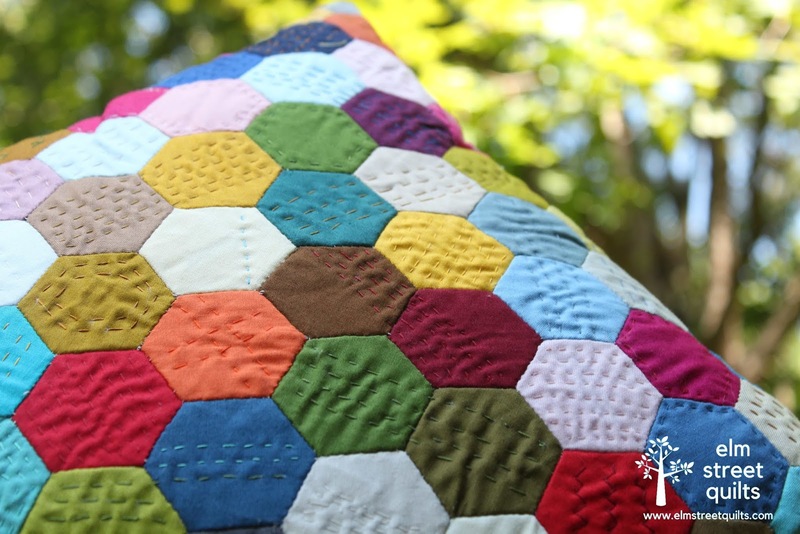 Thanks for sharing your hexie project. I really appreciate your comment about the batting chosen and hand fatigue for hand quilting. I've always wondered about that. Does anyone have an opinion about a batting that is easier to push the needle through? PS Good on you for choosing to be random by forcing yourself to pick out of a bag. Lovely pillow, I like the hand quilting. Beautiful work! Your pillow is so beautiful! The quilting is also gorgeous. In fact you answered a question for me. I am working on a Grandmother's Flower Garden Quilt that I wish to hand quilt. Your sharing was a great example for me! Thank you for sharing! 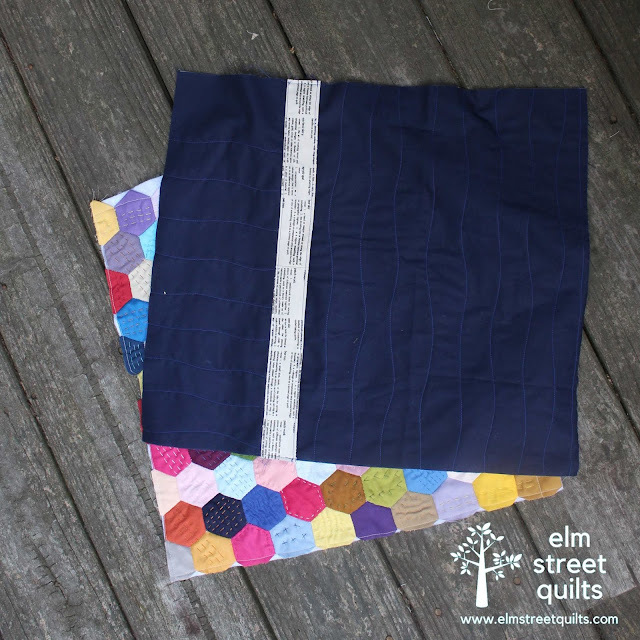 The quilting just adds so much interest to the scrappy hexies! Nice photography! Fun finish, I am well aware of your pillow talents :) You have made another treasure!! Gorgeous finish! Glad you have it in a place you can really enjoy it. What a fun project! It looks lovely on your couch and the chair. I have loved watching the progress on this project! 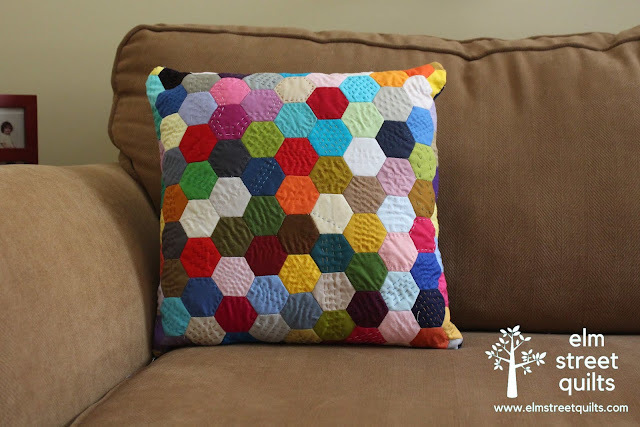 I really love how it turned out and I especially like that you went random with the quilting, too! I love everything about this!! Thank you for explaining what you did each step of the way! I love the randomness of the hexies and the hand quilting!! I know you will enjoy this pillow for years to come!! Hi Patty, that's a great pillow. 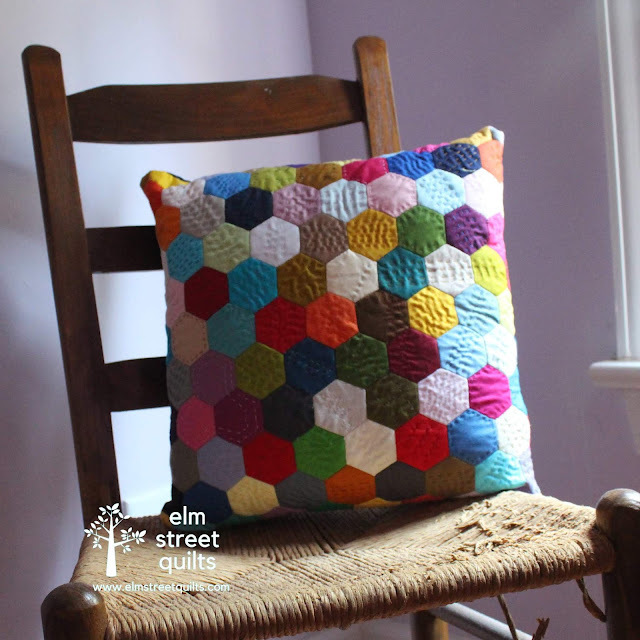 It's not easy for most of us to truly do random :-) I really like your hand quilting. It really adds to it. What a fun idea!! It looks perfect on your couch! Congratulations! I love the random hand stitching! The pillow turned out awesome! Looking forward to your temperature quilt.